For this month's "Maps Of The Month" featurette, I wish to draw your attention to Piranhaplant's New Super Mario Bros. (DS) maps. In recent years, on the tenth of March (i.e. "MAR10"), I've tried to play a Mario game to celebrate one of the greatest - if not THE greatest - video game characters of all time. Also, the 3DS turns one year old this month - and yet, despite its predecessor's popularity, we have only had one other Maps Of The Month recognition for it. I'd say it's time to have another! New Super Mario Bros. on the DS is, perhaps, not a surprise in any way. We know Bowser's up to his tricks, we know we've got to save Princess Peach, and we know there's going to be jumping and stomping and using power-ups along the way as we trek across various sorts of worlds. The title of the game is simple and unsurprising too...New Super Mario Bros....yep, it's a Super Mario Bros. game through and through, and it's new(er). But that's not to say it's bad. On the contrary, it's good. Though there are certainly differences between every Mario game to keep them fresh, the core gameplay remains mostly the same. If it's tried-and-true and we never grow tired of it, you know there's no need to fix something that isn't broken. And like every Mario game, it just looks great. The game's stages are colourful and varied. There's lots to see, but also lots of secrets to find. Piranhaplant has fulfilled any need to see each stage in their entirety for us here on VGMaps, and gets his second Mapmaker Of The Month recognition for it. No Star Coin will elude you now! 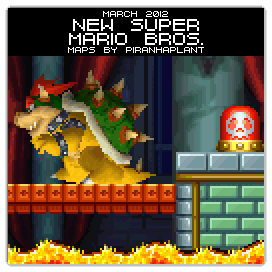 So to recognize the effort put into mapping more Mario, Piranhaplant's New Super Mario Bros. (DS) maps will be known as VGMaps.com's Maps Of The Month for March 2012. Congrats! These maps definitely deserve it. I know I've used them as a reference a number of times, and they saved me a whole lot of time. Though, looking at it now, I think the logo deserves to be updated with proper coloring. Come check out the Nintendo 64 Mapping Workshop!